Modern and simple. Two words that express the aesthetic of Unis and the line's designer Eunice Lee. She launched the label in 2000, with a focus on American-made clothing that was tailored yet comfortable, stylish but not trendy. The independent designer has weathered both a bad economy and rise of disposable fashion. We sat down with Lee to discuss the importance of buying quality and her plan to get every man in a suit. The new suits are as affordable as some mall stores, and yet they're really well made, here in the US. How does that work? I've been working to make my line more accessible for some time. Because I now have two retail stores and an online shop, I can sell more directly to customers and not be forced into additional mark-ups. There's a huge give-and-take to manufacturing in the US. It is extremely expensive. So, I hope guys actually understand how insanely affordable these suits are. I'm definitely not getting rich with these prices. But, I'd rather more men be able to own my suits, than make a huge profit. It's so great to see the stuff I've designed actually on guys. What are the benefits of being a woman designing for men? I definitely have an opinion of how I would like to see a man dressed, and what I think looks good on a guy. At the same time, I can be more objective because I'm not designing for myself. I think some of my male counterparts can be a little stubborn, because a lot of the time they're designing for themselves. I'm designing based on what I like, but also based on what the guys I know want. Wear and buy what makes you feel confident. A good wardrobe is one that's full of those staple pieces that you can grab, throw on and look hot and effortless in. Think modern and clean. You want your clothes to say "I have good taste" and "I know what I like." Also, buy clothes that fit. 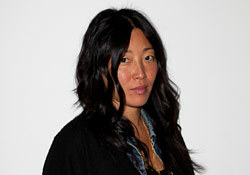 Before launching her own line, Lee designed for DKNY, Structure, and Joseph Abboud.